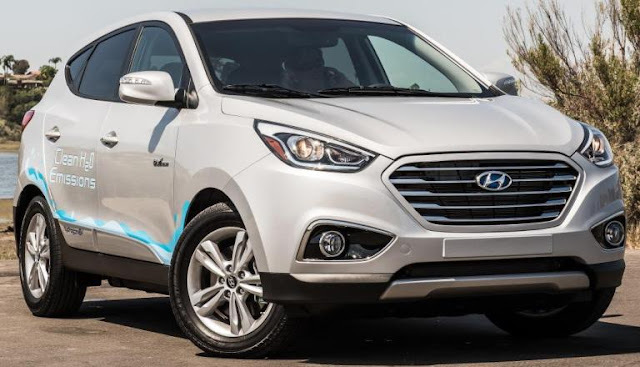 The Hyundai Tucson Fuel Cell zero-emissions, hydrogen-powered vehicle, which began mass production in February 2013, continues its lease program to Califronia customers for $499 per month for a 36-month term, with a $2,999 down payment with unlimited complimentary hydrogen refueling and At Your Service Valet Maintenance at no extra cost. The Hyundai Tucson Fuel Cell vehicle has a driving range of 265 miles and a refueling time similar to gasoline vehicle of same size at about five minutes. The 2017 Chevrolet Colorado, like its GMC Canyon sibling, offers an all-new 308 horsepower V-6 engine mated to an eight-speed automatic transmission. Active Fuel Management (cylinder deactivation) which disables two cylinders under light throttle applications. 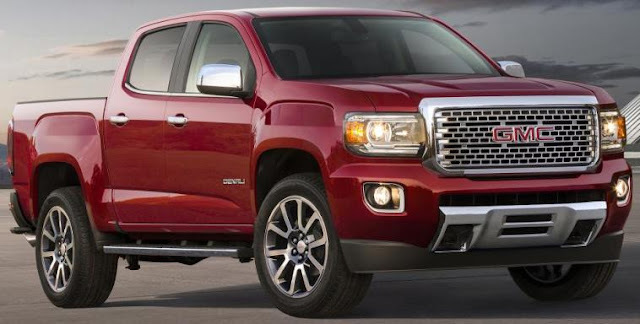 It is the latest major update for Colorado, which entered the market for model year 2015. The 2017 model year updates, including the new V-6 and eight-speed combination, will arrive at dealerships in the fourth quarter of this year. General Motors and the U.S. Army Tank Automotive Research, Development and Engineering Center (TARDEC) will reveal a Chevrolet Colorado-based fuel cell electric vehicle in October at the Fall meeting of the Association of the United States Army in Washington, D.C. The 2017 GMC Canyon lineup adds a new range-topping Canyon Denali, with chrome exterior details and unique wheels, and new off-road-inspired All Terrain X, both powered by a new 308 horsepower 3.6L V-6 engine paired with an eight-speed automatic transmission. 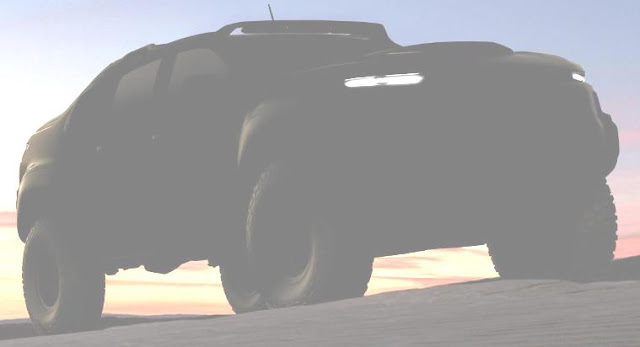 The All Terrain model features like off-road suspension and transfer case shield and Hill Descent Control, along with an optional 2.8L Duramax turbo-diesel engine available. The 2017 model year updates, including the new V-6 and eight-speed combination, will arrive at dealerships in the fourth quarter of this year. Zack Hicks, CEO & President of Toyota Connected discusses new Toyota start-up aimed at providing user-friendly technology for drivers. Toyota Connected, Inc., based in Plano, Texas, will expand data management and data services development serving as a data science hub for Toyota’s global operations and will support a broad range of consumer-, business- and government- facing initiatives. Toyota Connected will leverage the power of data science through Microsoft’s Azure cloud technology to develop predictive, contextual, and intuitive services that help to humanize the driving experience. Program areas will include in-car services and telematics; home/IoT connectivity; personalization; safety; smart city integration; and a broad range data services for Toyota affiliates, its dealers; fleet services and more. Toyota Connected says it will operate in full support of Federal Trade Commission’s Privacy Principles for Vehicle Technologies and Services. The Cadillac Escala Concept large 4-door sedan powered by a new 4.2-liter twin-turbo V-8 engine utilizes Cadillac’s new RWD-centric large luxury car architecture and features an expansive liftback design is 210.5 inches long overall, roughly 6 inches longer than today’s CT6. The Lamborghini Centenario Roadster with limited production of 20 worldwide to be delivered through 2017, is powered by a 770 horsepower V12 naturally aspirated engine in a body made completely of carbon fiber. The car is equipped with an extending rear wing for downforce at high speeds and rear-wheel steering. Accelerating from 0-62 mph in just 2.9 seconds the Centenario Roadster’s top speed is more than 217 mph. Like the Lamborghini Centenario Coupé all 20 Roadsters have already been sold for a starting price of $2,264,900. The all-new 2017 Nissan Armada full-size, 8-passenger SUV, offered in SV, SL and Platinum trim levels, is powered by a new 390-horsepower 5.6-liter Endurance® V8 engine mated to a 7-speed automatic transmission and is 1.2 inches longer on a 2.1-inch shorter wheelbase, 0.6-inch wider and 2.2-inches lower in height than its predecessor. The new Armada offers standard towing capacity of 8,500 pounds for both 4WD and 2WD models (when properly equipped). 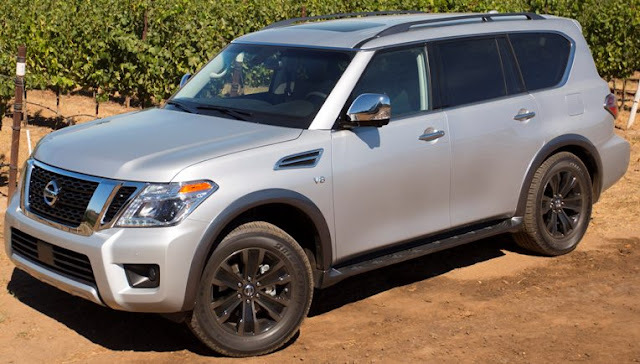 Pricing for the Armada SV two-wheel drive model, which is on sale now at Nissan dealers nationwide, starts at $45,395 (including $995 Destination and Handling) and goes up to $60,985 for the Armada Platinum AWD. Fuel economy will be announced at a later date. mated to a 10-speed automatic transmission will be priced at $62,135 (including destination charge) for coupe models and $69,135 for convertibles, when they go on sale later this year. The 1LE package is a $4,500 MSRP option on Camaro V-6 LT coupe models and $6,500 on the V-8 1SS coupe model. 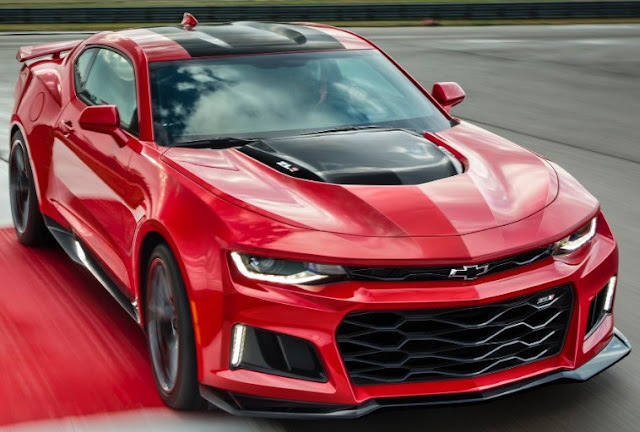 For LT coupes, the 1LE package features the Camaro SS’s FE3 suspension, while the 1SS has the ZL1’s electronic limited-slip differential and FE4 suspension with Magnetic Ride dampers. The new 2017 BMW 740e xDrive iPerformance is powered by a plug-in hybrid drive system using a 255 horsepower four-cylinder TwinPower Turbo gasoline engine and an electrical unit with maximum output of 111 horsepower integrated into the 8-speed Steptronic transmission to generate a system output of 322 horsepower. The BMW 740e xDrive iPerformance can be driven in all-electric mode up to 75 mph. Combined fuel economy of 64 MPGe and an all-electric range of 14 miles is possible (EPA official figures). The 0 to 60 mph time is 5.1 seconds with a top speed electronically limited to 155 mph.The eDrive button on the center console allows the driver to select from the AUTO eDRIVE, MAX eDRIVE and Battery Control settings, to determine the operating approach of the plug-in hybrid drive system. The high-voltage lithium-ion battery has a gross capacity of 9.2 kWh (net capacity: 6.5 kWh) and consists of 96 cells arranged in six modules with its own cooling system integrated into the climate control system for the interior. The 2017 BMW 740e xDrive iPerformance is already in production and will arrive at U.S. dealerships in August starting at $90.095 (including $995 Destination and Handling). General Motors (Chevrolet, GMC, Buick and Cadillac) total sales in July were 267,258 vehicles, down 1.9 percent. Through the first seven months of the year, total GM sales are 1,706,173, down 4 percent. Ford Motor Company’s U.S. sales were 216,479, down 3 percent. Year-to-date sales of 1,569,527 is 3.5 percent higher than last year. Toyota Motor Sales, U.S.A. reported July 2016 sales of 214,233, a decrease of 1.4 percent from July 2015. Toyota division posted July 2016 sales of 186,343, down 0.5 percent while Lexus posted July sales of 27,890, down 6.5 percent. Year-to-date total Toyota sales of 1,412,033 is a 2.5 percent decline from a year ago. FCA US (Chrysler, Dodge, Ram, Jeep, Fiat, Alfa Romeo) reported U.S. sales of 180,727, up 0.3 percent compared with sales in July 2015. Year-to-date sales of 1,325,536 is a 4 percent gain over last year. American Honda Motor reported July sales of 152,799 Honda and Acura vehicles, a 4.4 percent gain over last July and a new July record. The Honda Division set a new July total vehicle sales record, rising 5.9 percent on sales of 139,125. Nissan Group (Nissan and Infiniti) announced total U.S. sales for July 2016 of 132,475, an increase of 1 percent over the prior year, setting a July record. Year-to-date sales of 930,589 is a 7.3 percent increase over a year ago. 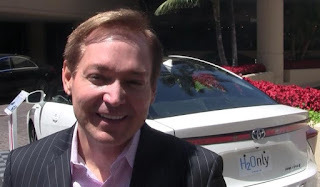 Hyundai Motor America reported sales of 75,003 for July, up 5.6 percent over a year ago and the company’s best July ever. Year-to-date sales of 449,063 is a 1.3 percent increase over a year ago. Kia Motors America reported best-ever July sales of 59,969, up 6.5 percent over the same period last year. Year-to-date sales of 388,296 is a 5.7 percent gain over a year ago. Subaru of America reported record July 2016 sales of 52,093 vehicles, a 3.1 percent gain over the same month a year ago. Subaru also reported year-to-date sales of 331,551 vehicles, a 2.7 percent gain over the same period in 2015. Volkswagen of America reported sales of 28,758 delivered in July. Year-to-dates sales of 177,772, are down 13.6 percent. Separately, Audi reported that its July sales increased 4 percent to 18,364 vehicles for its best July in the brand’s U.S. history. Year-to-date sales have risen 3.6 percent to 115,298 vehicles sold. Mercedes-Benz USA reported record July sales of 28,523 vehicles, increasing 3.6 percent from the same month last year. Mercedes-Benz Vans also reported best-ever July sales of 3,272, and smart reported sales of 493, up 11.8 percent bringing MBUSA grand total to 32,288 vehicles for the month, up 7.2 percent from last year. Mazda North American Operations reported July U.S. sales of 27,915 vehicles, representing an increase of 2.8 percent versus last year. Year-to-date sales through July are 173,269 vehicles. Sales of BMW brand vehicles decreased 4.4 percent in July for a total of 25,777 compared to July 2015. Year-to-date, the BMW brand is down 8.4 percent in the U.S. on sales of 179,213 compared to the first seven months of 2015. Jaguar Land Rover sales hit 9,473, a 51 percent increase from July 2015 for the best July sales month ever, with Jaguar sales at 3,398, up 174 percent and Land Rover sales reached 6,075, up 21 percent. Year-to-date, Jaguar Land Rover U.S. sales reached 57,112, up 23 percent from 2015 with Jaguar sales at 14,389, up 59 percent and Land Rover at 42,723, up 14 percent from 2015. Volvo Car USA reported U.S. sales of 8,584 vehicles, a 52.8 percent increase versus July 2015 and marking the thirteenth consecutive month the company posted double digit sales growth. Year-to-date sales are up 29.3 percent year-over-year. Mitsubishi Motors North America reported July 2016 sales of 7,890 up slightly from July of last year. Year-to-date sales of 59,824 is a 4.2 percent gain over a year ago. Porsche Cars North America announced July 2016 sales of 3,878 vehicles, an 18 percent decrease in vehicle deliveries compared to July 2015. Year-to-date, sales stand at 30,586, a year-over-year increase of 2.4 percent.